After U.N. Ambassador Susan Rice withdrew her name yesterday from consideration to be secretary of state, speculation quickly shifted to Sen. John Kerry, D-Mass., and former Sen. Chuck Hagel, R-Neb., both of whom are now reportedly serious contenders for Secretary of State and Secretary of Defense. Rice, who in her decision not to seek the nation's top diplomatic post cited an ongoing political battle over comments she made about recent attacks in Benghazi, was widely believed to be President Obama's top pick to replace Hillary Clinton after she steps down from the job next year. Now, all eyes turn to Kerry, the 2004 failed presidential candidate whose desire for the job is no secret in Washington, and who has been reported to be the other name on the president's Secretary of State short list. 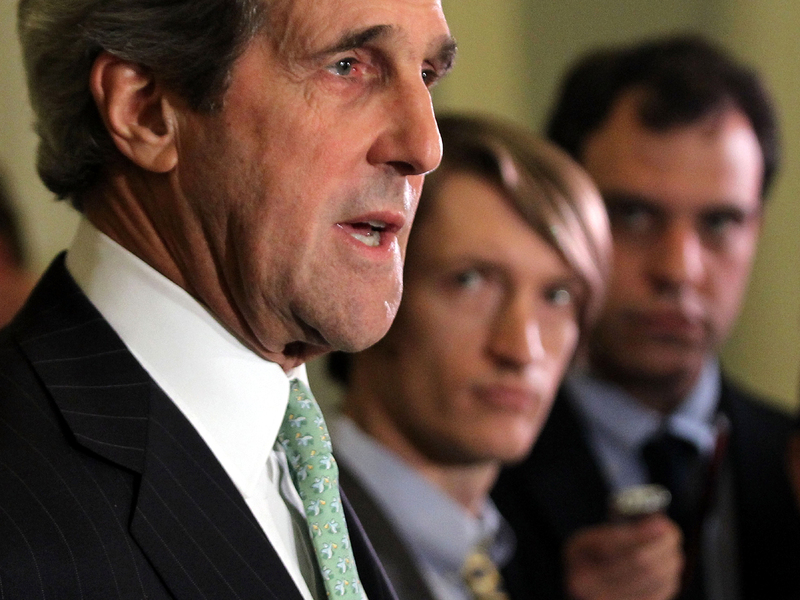 Many speculated that if Rice was tapped to be Secretary of State, Kerry would be named Secretary of Defense. In an interview last night, Mr. Obama said he had yet to make a decision about who to name for the job when Rice took her name out of the ring, and White House spokesperson Jay Carney would not comment on personnel decisions in his daily briefing with reporters Thursday. But the wheels appear to be in motion: Yesterday, reports emerged indicating that Hagel, a Vietnam War veteran who has backed Democrats in the past, had passed the vetting process and was a top contender for Secretary of Defense. Unlike with Rice, Senate Republicans have suggested that Kerry would sail through the confirmation process if tapped as Secretary of State: In a recent press conference targeting Rice's abilities, Sen. Susan Collins, R-Maine, offered up the Massachusetts Democrat up as her preferable candidate for the job. One possible hitch to a Kerry nomination: it would open his long-held Senate seat up for a potential GOP takeover in 2014. Kerry would have been a shoo-in for reelection but if he vacates the seat, it could open the door for Sen. Scott Brown, R-Mass., who lost his seat last month to Democrat Elizabeth Warren, to attempt to make a return to the Senate. Amid all of the speculation, the president himself has been mum on both the state and defense posts, and there's no indication announcements will be made imminently. Neither Clinton nor outgoing Defense Secretary Leon Panetta have made formal declarations about when exactly they will leave office, and Senate confirmation hearings won't happen until after the new year regardless. Moreover, with Rice out of the running, there's a real possibility that Mr. Obama would tap all white males for his top three cabinet picks - which could inspire some criticism from within the party. A handful of women have been floated for the top-tier jobs, but many expect that Jack Lew, the president's current chief of staff, will be named Treasury Secretary, along with Kerry and Hagel in the State and Defense departments, respectively. The president may well decide that, politically, it's not in his interest to make any announcements on the subject until the new year.